Hungerford had a workhouse in operation from around 1729 (Hitchcock, 1985). A parliamentary report of 1777 recorded parish workhouses in operation in Hungerford (for up to 30 inmates), Shalborn (16), Great Bedwin (30), Ramsbury (70), and Tidcombe (12). Tidcombe's parish workhouse stood at Fosbury and was probably closed in 1783 (VCH). Chilton Foliat acquired a workhouse or poorhouse in around 1804 and employed a resident governor who was also a salaried assistant overseer for the parish. In a parliamentary report of 1817, 9 of the 31 paupers regularly relieved by the parish were in the workhouse. In 1827, it had around 12 residents. Great Bedwyn (or Bedwin) had a workhouse in the mid 18th century, but by 1786 was using cottages at Wilton (VCH). This may have been the building at East Grafton near Wilton, latterly known as Church Cottages, which is said to have served as the local workhouse. The parish employed a master for the establishment and also paid a surgeon to attend the inmates. In 1795, there were 11 beds and 8 spinning wheels in the house. It had 19 inmates in 1802-3 and 12 in 1812-13. Rules in 1797 forbade inmates to leave without permission, receive visitors, or collect wood for fuel. East Grafton / Wilton parish workhouse, 2004. 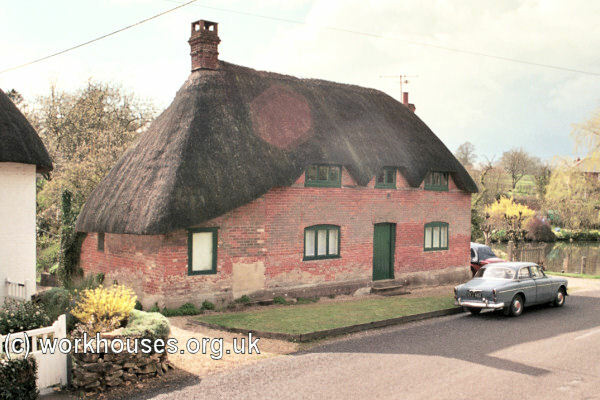 In 1792, Little Bedwyn had a building referred to as a workhouse which stood at Forebridge. Under an Act of 1800, Aldbourne set up a parish workhouse in a building at the junction of Oxford Street and South Street but it burnt down in around 1819. Berkshire: Avington, East Garston, Inkpen, Kintbury (2), Lambourne, East Shefford, West Shefford, West Woodhay. Wiltshire: Aldbourn, Baydon, Great Bedwin (2), Little Bedwin, Buttermere, Froxfield, Ham, Ramsbury (2). Later additions: Grafton, Hippenscombe, Tidcombe and Fosbury. Berkshire and Wiltshire: Chilton Foliat, Hungerford (3), Shalbourn. The population falling within the Union at the 1831 census had been 18,799, with parishes ranging in size from East Shefford (population 67) to Hungerford itself (2,715. The average annual poor-rate expenditure for the period 1832-35 had been £16,258 or 17s.4d. per head of the population. 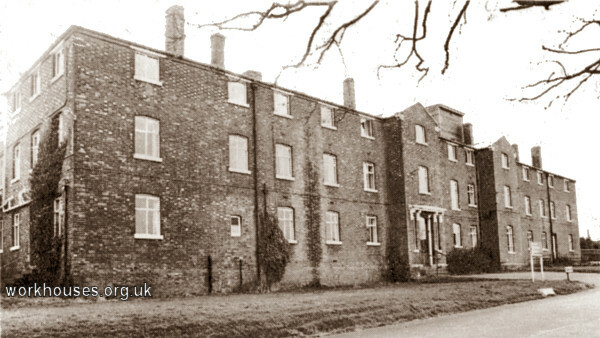 Initially, the union made use of the existing parish workhouse at Lambourn, together with premises at Charnham Street in Hungerford. The Poor Law Commissioners approved an expenditure of £3,250 on the upgrading work required. However, and entirely new building was erected in 1847 to a design by S O Foden at a site on the south side of Park Street. Its layout can be seen on the 1899 25-inch OS map. Hungerford workhouse from the east, early 1900s. Other Foden designs were built in 1843 at Cuckfield and at Rye, in 1844 at Aylesbury and at Bromley, and in 1845-6 at the nearby Unions of Faringdon and Highworth & Swindon. Hungerford Poor Law Union was renamed Hungerford and Ramsbury in 1896. 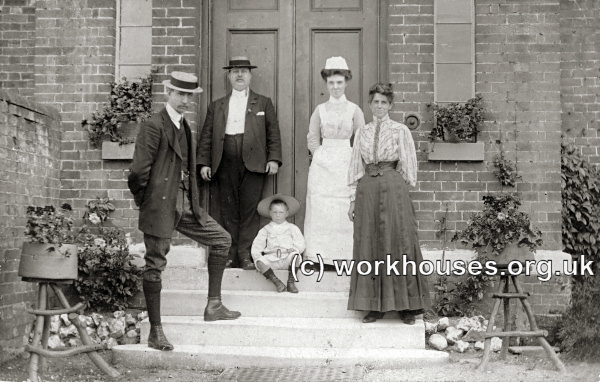 The picture below, from 1907, shows the master and matron on the steps at the workhouse main entrance. Behind them, against the doors, are the porter and superintendent nurse. 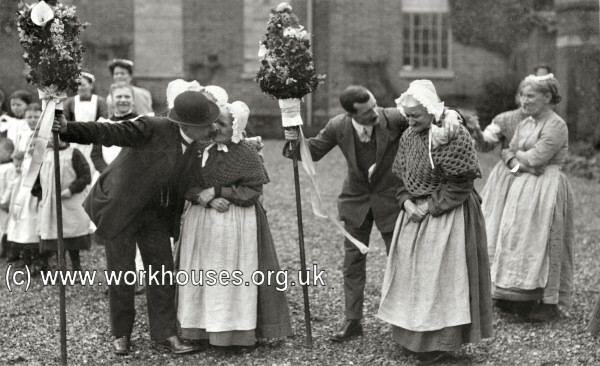 A local tradition was the festival on "Tutty Day" (Hock Tuesday, the second Tuesday after Easter) when a collection for parish purposes was made by men carrying poles wreathed with flowers. 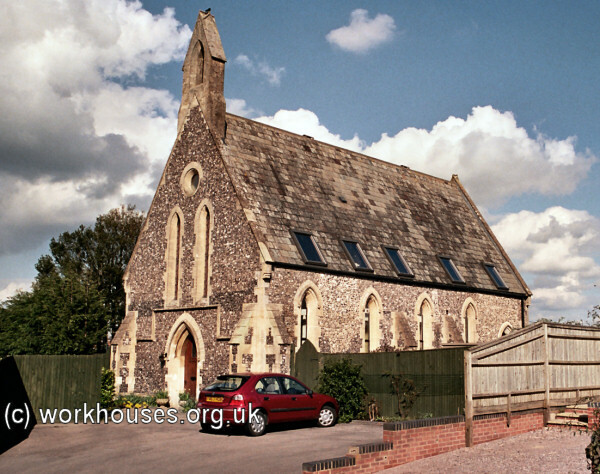 The workhouse buildings became the site of Hungerford Hospital and in 1992-3 Bosnian refugees from Vukovar were housed here. In the late 1990s, the site was completely redeveloped for housing. The only surviving remnant is the chapel building at the east of the site. Berkshire Record Office, Berkshire Record Office, 9 Coley Avenue, Reading, Berks RG1 6AF. Holdings include: Guardians' minute books (1835-1930); Births (1866-1914); Assessment Committee minutes (1862-1893); etc. The Victoria County History of Wiltshire , Vol XVI. Oxford University Press.